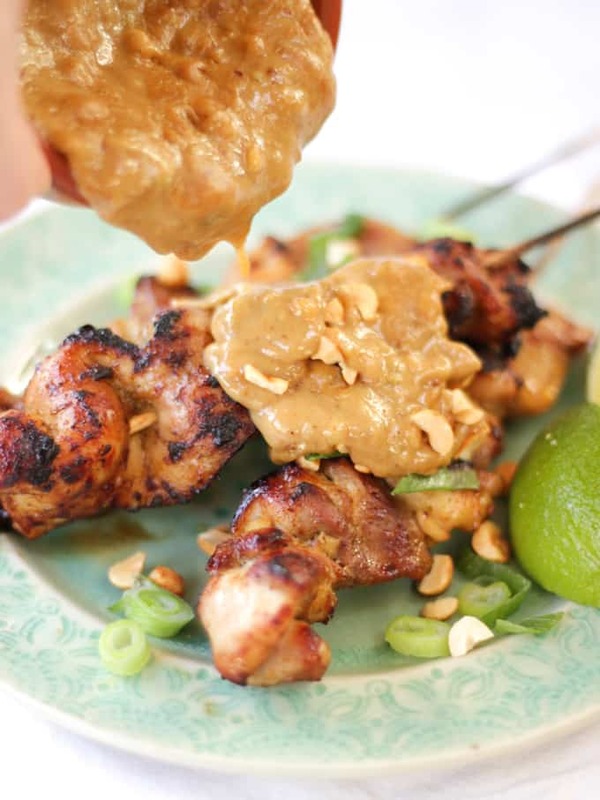 This Chicken Satay Skewers with Peanut Sauce recipe makes a really tasty family dinner. Learn to make this quick and easy satay sauce from scratch. 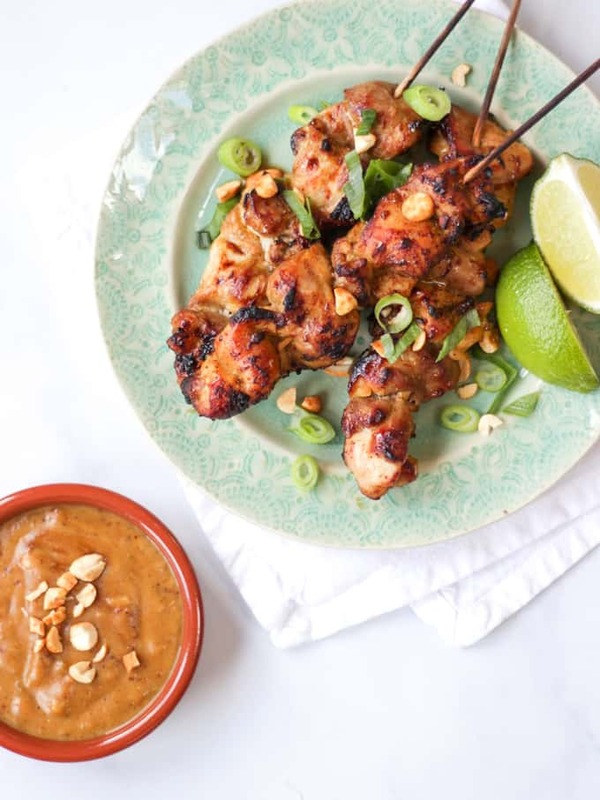 The marinated chicken satay skewers are served with a satay curry sauce made with peanut butter, garlic, honey and ginger. It also freezes well. I’m super keen on encouraging George and Harri to try lots of new and different tastes. It doesn’t always work. Often I receive a pair of well and truly turned up noses at dinner. BUT the more I persevere the more they do actually try. So this week a new taste on the table, Chicken Satay Skewers with Peanut Sauce. Oh hello Friday night takeaway replacement! It went down well, because anything with peanut butter in is a win right? How do you make Chicken Satay skewers? These chicken skewers are made using boneless and skinless chicken thighs and a simple, but super tasty marinade. How do you make Chicken Satay sauce? I make my simple Chicken Satay Peanut Sauce by using the same sauce base as the marinade, then adding peanut butters and coconut milk. This gives it a lovely, creamy, nutty texture and flavour. This recipe uses a mixture of smooth peanut butter and crunchy peanut butter. This adds both textures to the sauce and works really well. Don’t worry if you only have one type in the cupboard though, just use the same total quantity, it will work fine. Can Chicken Satay be frozen? Yes! I remove leftover cooked chicken from their skewers, pour over some of the sauce and pop into my usual freezer food saviour, my takeaway tubs (about £5 for 50 from Amazon). 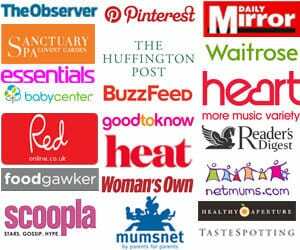 Then when we are ready to use them, defrost in the fridge overnight and warm through well in the microwave or gently in a saucepan. How do you cook Chicken Satay Skewers? This recipe grills the Chicken Satay skewers. You could pan fry them or even oven bake them, but I find that grilling them gives a really delicious, crunchy edge to them, slightly blackened, that adds to the flavour. 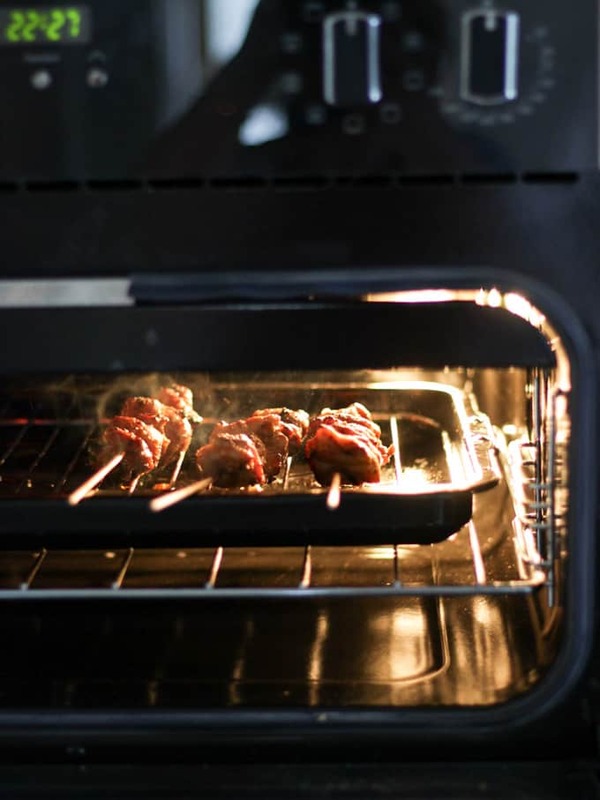 I grilled mine in the grill (or broiler if you’re in the USA) of my new Belling oven. It’s the perfect eye height to keep a look out for how they are cooking. There’s also so many settings to make sure that they toast just perfectly under there. This is by no means a low calorie dish, but if you’re serving it as a takeaway substitute and a treat, I think it works as part of an overall balanced diet. I also think it’s much healthier to make a recipe like this at home, which you know is made without too many highly processed ingredients, rather than a takeaway. 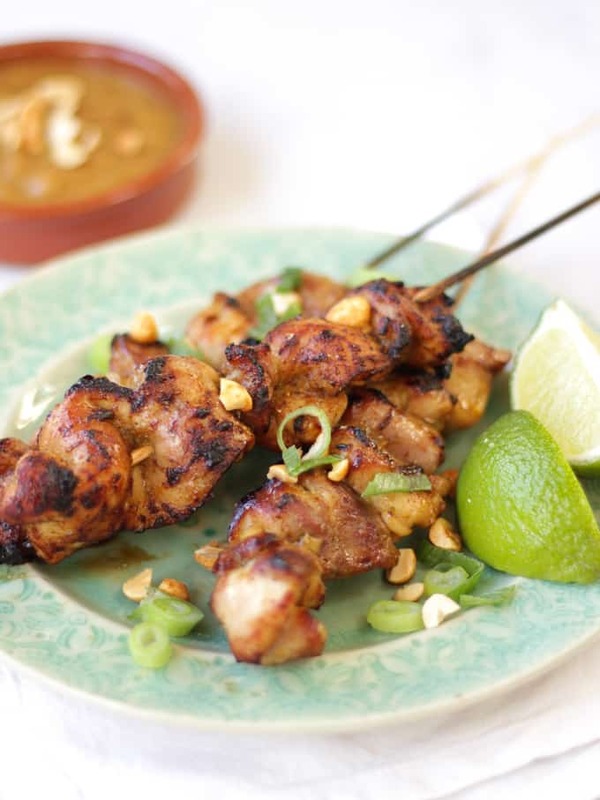 What do you serve with Chicken Satay? I serve this with the spring onion (scallion) and dry roasted peanut garnish, plus boiled rice and a light salad. Oh and of course the peanut satay sauce. I make a slightly thai style salad with red cabbage, cucumber, and carrots, dressed with soy sauce and honey. Hope you enjoy this recipe as much as we do. 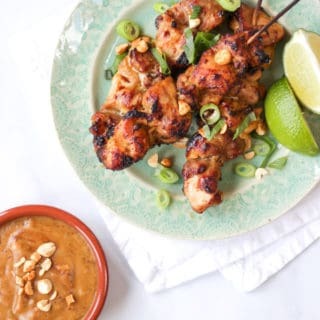 I’d love to know how you got on and what you thought of it if you make this Chicken Satay Skewers with Peanut Sauce recipe. Please rate the recipe and leave me a comment below if you do. 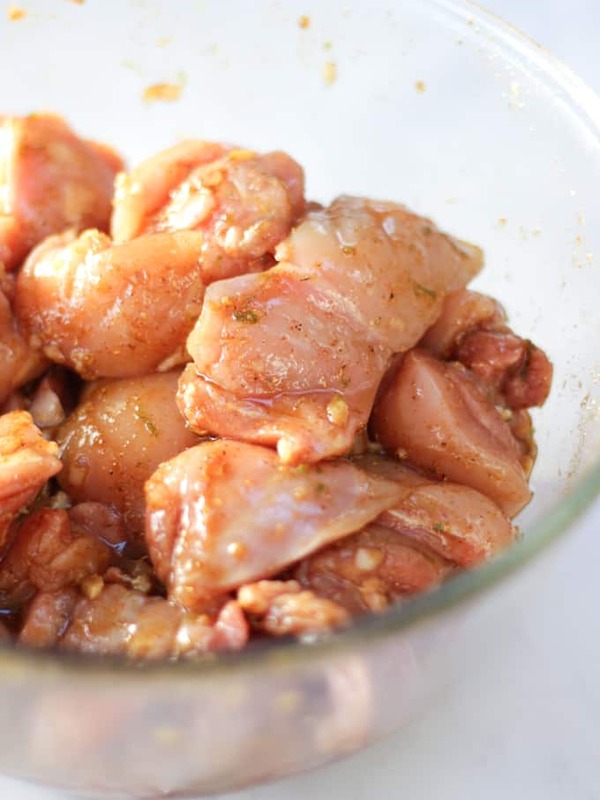 Mix all of the marinade ingredients together apart from the chicken. Set half of this to one side for later. Add the chicken to the rest and leave to marinade in the fridge for at least 2 hours. Put the skewers on the grill pan, under a hot grill and cook for about 10 - 15 minutes, turning regularly, until starting to blacken at the edges slightly. Whilst the chicken is cooking, put the reserved marinade into a small pan and allow it to bubble over a high heat for 5 minutes to reduce slightly and become thicker and syrupy. Add the coconut milk and peanut butters to the sauce and continue to cook for 5 - 10 minutes until thick and delicious. Serve the skewers and sauce together sprinkled with chopped spring onions and roasted peanuts. 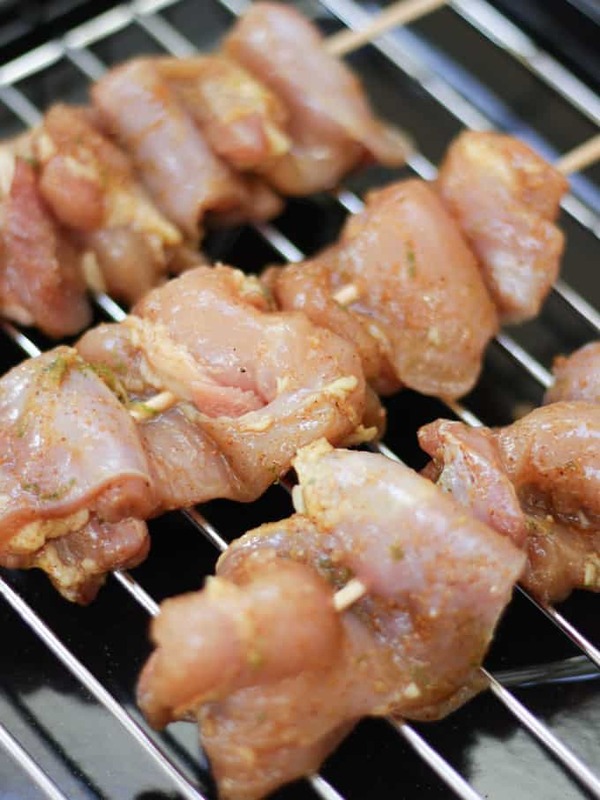 If you're using wooden skewers, soak them in water whilst you marinade the chicken, this will stop them burning. As you can see from my photos - I forgot this time! Make sure you use sugar free, palm oil free peanut butters. They taste so much better than the highly processed stuff. You make need more coconut milk than stated, add a little more (the rest of the tin) if your sauce is too thick or if you prefer it to be thinner. « Salted Caramel Cheesecake Recipe – Easy No Bake Recipe! Had this for dinner this evening, served with rice with kale, garlic and ginger. Was absolutely delicious, thank you! !